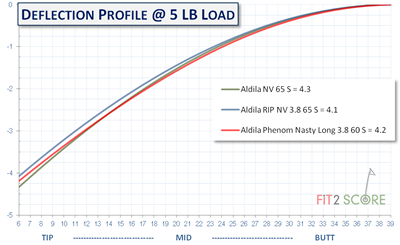 Like many designs from Aldila, the Rip Phenom Nasty Long has profiles matched fit to the anticipated use of the shaft weight. The 60 gram version is a higher launching design than the 70 gram model. The design profile is similar to the RIP line and the RIP NV,where we see a reversal of the mid stiffness, compared to the original NV. However the Nasty long takes this to a new level, with the mid stiffness staying constant or slightly increasing from about 25″ to near 15″. This gives a much stiffer mid and upper tip section before declining again as it progressed toward the tip. Radial quality is excellent and is suitable for the popular adjustable drivers. 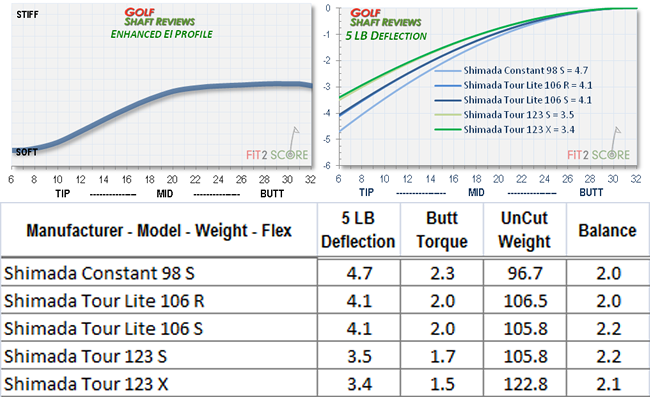 The low torques of the Tour shafts provides good tip stability for higher swing speeds. Phenom Nasty Long 60S – This shaft really performed well with my normal swing. It felt a little stiffer than the RIP NV, which feels good, but it certainly gave me excellent performance. I like to hit a slight draw and I was able to hit that shot with little effort and it gave me the launch and spin I was looking for. Phenom Nasty Long 70S – This shaft performed very well, but I had to work really hard to make it perform. I can make it work but it is probably a little too heavy for me with my normal swing. I prefer lighter feeling shafts and this would not be my first choice but it performed as well as the 60S, it just took a little more effort than I prefer. This entry was posted in Aldila, Driver Shafts, John Dranschak - Dead Perfect Solid Golf Clubs on February 28, 2014 by John Dranschak.